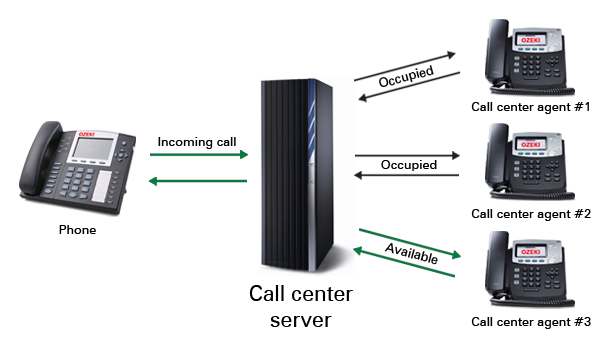 This article is a brief introduction about presence information in call centers in relation with Ozeki VoIP SIP SDK. After reading through this page you will be fully familiar with all the essential terms concerning SIP presence information in call centers and what you will need for creating your own solution using Ozeki VoIP SIP SDK. The call routing is the very basic function of a call center server that performs the distribution of the incoming calls between the call center clients. The call routing can be implemented in different ways according to the routing method you want to use. The basic problem of any call routing is that the server has to be able to decide if a call center client can receive a call or not. The simplest cause for not being able to receive a call is that the client is occupied with an existing conversation, but there can be other cases too. The call center agent needs to be able to set their presence information to notify the server if they are able to receive a call. The presence information can specify if the agent is not at the computer at the precise moment and therefore they cannot answer a call. It can be easily see that setting the presence information is a basic problem in call routing process. This article introduced you the basic knowledge about SIP presence information handling in call centers and showed how Ozeki VoIP SIP SDK can help you to fulfill your wishes about this topic. If you have read through this page carefully, you already have all the knowledge you need to start on your own solution.